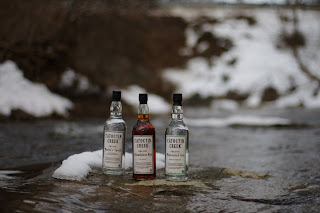 My father suggested that my recent photo shoot of "whisky in the creek" might have been easier had I opted to skip the ice cold creek, and simply Photoshop the bottles into a creek scene. This comment pleased me greatly, because it meant that he didn't realize that the original photo was indeed quite a heavy Photoshop! The first thing we (Luke and I) did was make the gin bottle cap green. I don't have any green closures yet, so this was an easy change. 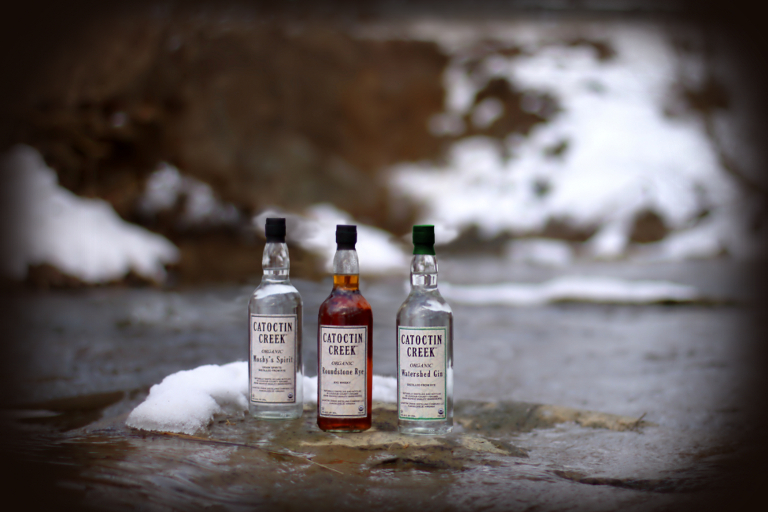 Remember too, that the bottles are clear, so the images in the glass are important for consistency of the shot. This is really hard to fake convincingly in Photoshop. Finally, the contrast, saturation and white balance were adjusted, and a vignette was added around the photo to draw people into the scene. Here is the original photo. Still, nothing like getting your feet wet to get the basic good shot. Shot in RAW on a Canon EOS Digital Rebel XTI, 35 mm fixed telephoto lens, AV mode, 1/3200 sec, F/1.4, ISO 200. Post processed in UFRaw and GIMP. You are such a techno-geek! & thanks for the Cliff Claven info today. I took some more pictures of the buzzards invading the neighbor's roof this morning. Haven't gotten them onto the blog yet, though.